On April 28, in front of the Tomise-utaki in Tomigusuku Castle Park, kaminchu prayed for a good grain harvest and for the safety of the Naha harii. On April 28, the eleventh festival commemorating the origin of Harii dragon boat racing was held in front of the Tomise-utaki in Tomigusuku Castle Park. Tomigusuku is said to be where harii dragon boat races started. At the ritual, Tomigusuku nubui, noro and kaminchu from Tomigusuku, Nesabu, Kakazu, and Madanbashi offered sweets known as popo and amagashi to the gods and prayed for a good grain harvest and for the safety of the Naha Dragon Boat Race. A noro is a hereditary sacred woman and a kaminchu is a shaman who specializes in religious practices in Okinawa. After praying to the gods there were songs for harii and a karate performance. 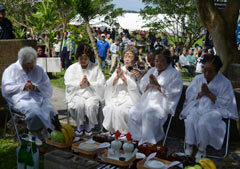 Many people, including members of the Naha Haryusen Association, took part in the festival. In 1393, Wanouso, a nephew of the King of Nanzan, one of three kingdoms that controlled Okinawa in the 14th century, was impressed by dragon boat racing when he studied in Nanjing in China. After he came back from China, he made a dragon boat and showed it off on Lake Manko. People were impressed by the dragon boat and soon learned how to make it for racing. Chairman of the Naha Haryusen (dragon boat) Promotion Association Toyoaki Kinjo said, “We made a world-class dragon boat last year. We would like to wish you all good health, long life and good luck with the race.” In the afternoon, a reenactment of the entertainment on the boat was delivered on Lake Manko, imitating the Wanouso dragon boat of 600 years ago. Many people enjoyed riding in the boat.